Tippletown has closed. 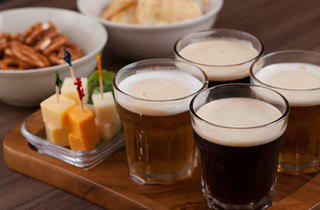 Look here for a list of Singapore's best craft beer bars. Originally a beer delivery website, Tippletown is now also a Club Street bar space. At the helm here is Dax Guei, a F&B industry veteran with over 20 years on the operations end of restaurants like Hard Rock Café and Chili’s. ‘It was actually through a consultancy role at Heart of House [a pub on Kim Tian Road] that I grew a love for craft beer,’ says Guei. In wanting to offer the area something different from the lager swill available in just about every other bar, Guei hunted down craft beer distributors locally and got acquainted with microbrews. With those factors in mind, it’s only natural that craft pours reign supreme here. The décor is kept deliberately simple, with tempting posters of their dishes placed in the low light against jet black walls. Receiving the most illumination, of course, are its beer fridges, which look over the indoor seating like a glowing tabernacle to the cult of beer. Tippletown’s selection democratically caters to drinkers new to good booze with fruity Belgian styles and German wheats, but will notably please seasoned drinkers with its growing and more dominant list of American and modern British-style pale ales, India pale ales, stouts and porters (from $10 to $32). Guei also uses his beer industry connections to the benefit of his customers, securing super limited edition beers in bottles and on tap. Case in point: he scored a coup in getting all four varieties of Brewdog’s very limited IPA is Dead series of beer – the Dana, Waimea, Goldings and El Dorado singlehopped beers by the iconoclastic Scottish brewery – at the bar’s opening, while other joints and bottle shops had to settle for just one variety. 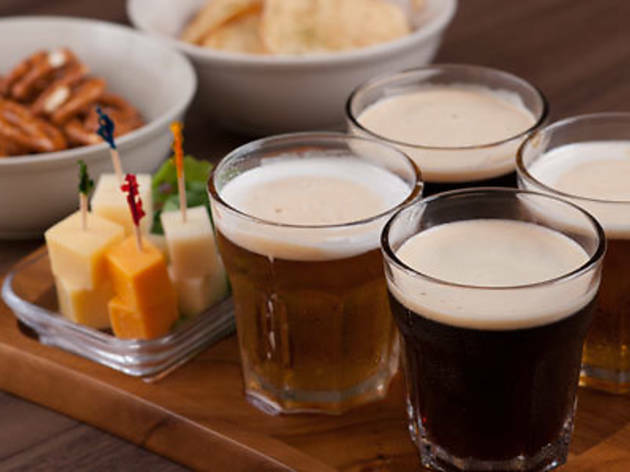 Beer promotions are themed month by month (July’s focus is on American beers with Deschutes, Lagunitas and Magic Hat among others on offer) and Guei incorporates an education element to the bar by offering a beer flight of 120ml tasting samples. Another distinction setting Tippletown apart from the regular bar is its food – particularly the solid, hearty mains. You won’t find the deep-fried carbs that usually accompany a good pint of suds elsewhere, as their kitchen doesn’t quite have ability to deep-fry (it doesn’t have a back door or an exhaust) – instead, skip dinner and indulge in their signature Jungle steak pie ($20) or chicken & mushroom pie ($20). We love that chef Eunice Koh, together with Guei, support local and worked in Jungle Beer’s award-winning Kiasu Stout into the former. Both are good-sized pucks of buttery, crispy pastry and meaty inners, topped with a scoop of mashed potatoes loaded with bacon (also available as a side, $5). Beers from $10, mains from $14.